"I saw these beautiful words on a baby's headstone in South Carolina when I was looking for inspiration for Lily's stone - "Sleep on sweet babe and take thy rest. God called thee Home, He thought it best." I am clinging to this on what is a very difficult weekend for me... Mother's Day. God thought it best to call Lily Home and I find comfort in that. It doesn't take away the pain of days like Mother's Day or the rest of my life without her, but I trust that He holds both of us in His mighty hands. He was not surprised by how brief her life was and has a purpose and plan even in that. As JJ Heller sings in one of her songs, "Life is short, but it is wide, I know it's true. You touched more souls than most people ever do." He called me to be a mother to a child of Heaven and because He has called me to this, I know He will sustain me each and every moment. Oh my baby girl, I'll see you soon. I will always be your mother and you will always be my daughter." I'm remembering these words of trust and hope written a year ago, as I am feeling so down today, missing my little Lily love and wondering if I'll ever have a child to raise. I experience both mourning and longing. I don't always *feel* these words I wrote and I would be lying if I said I did. But even when I don't feel them, I *choose* to believe them. I choose to trust He sees me and has not forgotten and that it's *all* for a purpose to bring Him glory. I want to take a moment to remember many others today too: Happy Mother's Day to my wonderful mother and grandmother, as well as the "traditional" mothers, single mothers, those who've lost a child at any age or gestation and for any reason, stepmothers, foster mothers, pregnant mothers, adoptive mothers, those who placed their child for adoption, those who long to be mothers and are not because of infertility or circumstances, those whose mothers are no longer living, those who are not in a relationship with their mother or child for different reasons, the mothers of children gone astray, and anyone else I've forgotten. Know that I hold you in my heart and prayers on this day that I am so thankful for the little girl who made me see more clearly the pain of others so that I might reach out to be a place of comfort. 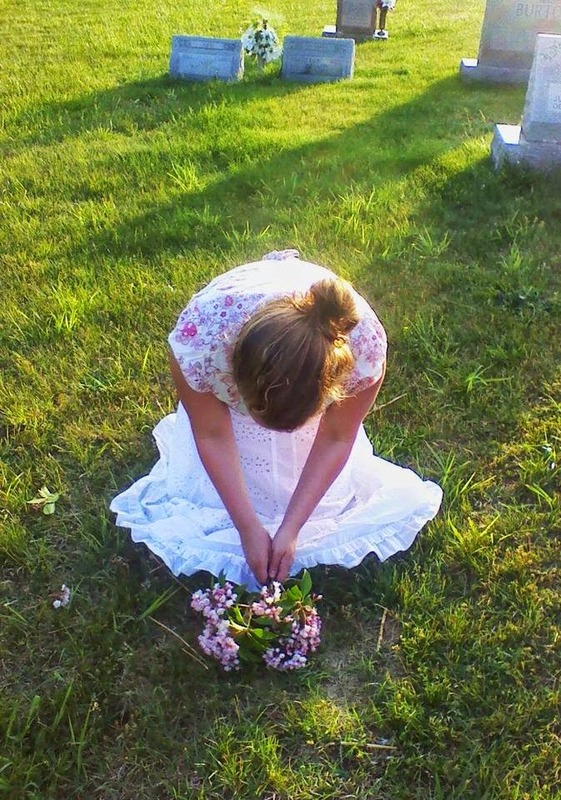 I love this photo - it was taken at Lily's special spot the first time I visited it after her burial, which was the week of my first Mother's Day, 2010. The week I was going to have a baby shower with friends and family in Virginia, but instead I celebrated my daughter in Heaven. I sure wish I could be there today to take her some fresh flowers.